Are you in need a custom color, size, or material o-ring/seal? Captain O-Ring specializes in helping you determine the o-ring you need for your application as well as manufacturing seals with short lead times, quick turn around, and low minimum order quantities. Most materials are available in durometers (hardness) from 45 to 95 Shore A. The suitable medias listed below are only basic examples and are by no means an exhaustive list. Please let us know the media in which your o-rings will be exposed to so that we can confirm the appropriate material that is most suitable and economical for your use. We stock over 25,000 mold sizes. AS568A is the American standard for o-ring sizing. If you need a size outside of the AS568A spectrum, we most likely have a mold for it already. If we don't, we work directly with mold makers to get you the lowest tooling cost for your mold. This allows for a huge savings when producing odd size parts. We can produce any size o-ring as well as any shaped parts such as V-Rings, X-Rings, etc. 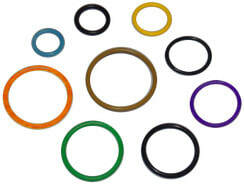 Captain O-Ring LLC specializes in colored o-rings. We are capable of producing most materials in virtually any color. We do have a list of stock colors for which we often mold common materials such as NBR. This creates shorter lead time and slightly lower costs and minimums for these colors than completely custom colors. If you would prefer a color that you do not see on the chart above, we can produce virtually any Pantone color for you.